Kookaburras are large kingfisher birds. They are brown with black stripes and their underbelly and around their necks are white. They also have patches of blue with black stripes on their wings. They have long pointed beaks. Their call sounds much like loud, echoing human laughter. They are found in Australia, New Guinea and the Aru Islands. Kookaburras eat lizards, mice, snakes and insects. Kookaburras live in rainforests, in holes in trees. 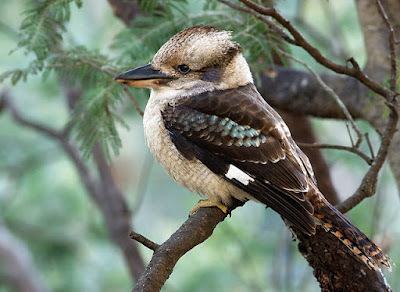 The strange laugh of the Kookaburra is used in many jungle films as a background noise, even if the movie isn’t supposed to be about a jungle in the area where kookaburras are found. Kookaburra was included in the genus Dacelo which was introduced by the English zoologist William Elford Leach in 1815. The name Dacelo is an anagram of Alcedo, the Latin word for a kingfisher. Kookaburra is the most social birds will accept handouts and will take meat from barbecues. In Australia, coins and stamps have been made with pictures of kookaburras on them. All kookaburra species are listed as Least Concern. Australian law protects native birds including kookaburras. They kookaburras are territorial bird, except for the rufous-bellied, which often live with their young from the previous season. They often sing as a chorus to mark their territory. The kookaburra was one of the three animals chosen for the 2000 Summer Olympics.